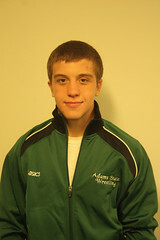 Adams State sophomore wrestler Jerry Huff (Broomfield, Colo.) has been named the ASCGrizzlies.com Athlete of the Week for the week ending Jan. 22. Huff is one of two ASC wrestlers to be 3-0 in Rocky Mountain Athletic Conference duels this year. He is 4-0 overall this year. On Thursday, Jan. 19, Huff pinned Fort Hays State’s Colin Hase in 4 minutes and 48 seconds. ASC went on to beat Fort Hays 21-19. On Friday, Jan. 20, Huff beat Central Oklahoma’s Ryan Brooks. A 12-1 win by major decision put the Grizzlies up 4-0 to start the night. Huff scored three take downs in the match and earned five points in the second period with 3-point and 2-point near falls. The Grizzlies topped Central Oklahoma by a score of 28-10. Huff’s efforts have helped ASC improve to 4-0 in dual meets this season. The Grizzlies will face Nebraska-Kearney on Wednesday, Jan. 25 at 8 p.m. at Plachy Hall. Huff received two first place votes from media members and no votes lower than second place. He also came in second place in the on-line fan voting, with 24.2 percent of the votes cast. Other nominees for the award included men’s basketball player Marcus Richards (Los Angeles, Calif.), women’s basketball player Chloe Cable (Glendale, Ariz.), men’s track and field athlete Boris Berian (Colorado Springs, Colo.) and women’s track and field athlete KayMarie Jones (St. Elizabeth, Jamaica).